Insomniac Games has done the unthinkable, and added the Sam Raimi Spider-Man suit to Marvel’s Spider-Man on PS4. This suit was requested by fans for a long time, and everyone eventually assumed that the suit was never going to come. 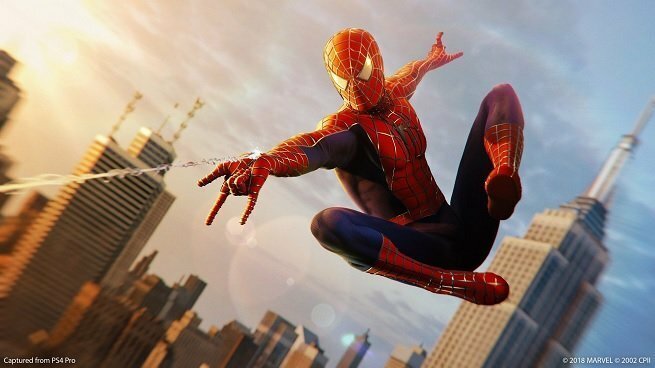 Today, Insomniac announced through its Twitter account that the suit is now in the game and, surprise, it’s free! This was an unexpected move, and took everyone by surprise. We’re hot off the reveal of three new suits coming to Marvel’s Spider-Man tomorrow. The third installment of The City That Never Sleeps DLC drops tomorrow, December 21, and it includes the “Into the Spiderverse” suit, the “Cyborg Spider-Man” suit, and the “Aaron Aikman Armor” suit. With those three suits revealed, we figured we were done. Insomniac had different plans. While we’re definitely happy to see this nostalgic throwback make it into the game, it is a little upsetting to see that many abusive fans seem to think that they’ve achieved some kind of victory. A veritable army of whiny, abusive gamers have been abusing and harassing Insomniac Games employees and social feeds for months because the Raimi suit was not included. No doubt they’re going to think that Insomniac added this suit in order to appease them. That, as you can imagine, is probably going to lead to even more whining and abuse whenever gamers feel like they’re being deprived of something they deserve. Regardless, true fans were already having a blast with Marvel’s Spider-Man, and we’re all happy to see the Raimi suit appear in this gorgeous game. Make sure you update your copy ASAP and check it out. A 90s Kid is an active website and media channel, dedicated to providing you information and entertainment related to the video games industry.